Today we began our journey to bike across America. I am resting here in my tent with fifty miles behind me, and I greatly anticipate the forty-five hundred miles before us. Our first day has been filled with mishap, adventure, pain, and exhilaration. When we first set out from the motel this morning, we visited a local bike shop for a few tools we may need for on the spot repairs. While there, Brian discovered a problem with his braking system and had to replace his brake cables. I ran a few errands to the hardware store and an outfitter. I can’t find denatured alcohol in any of these towns’ outfitters, so I may soon be investing in a new stove. Anyway, about the day. 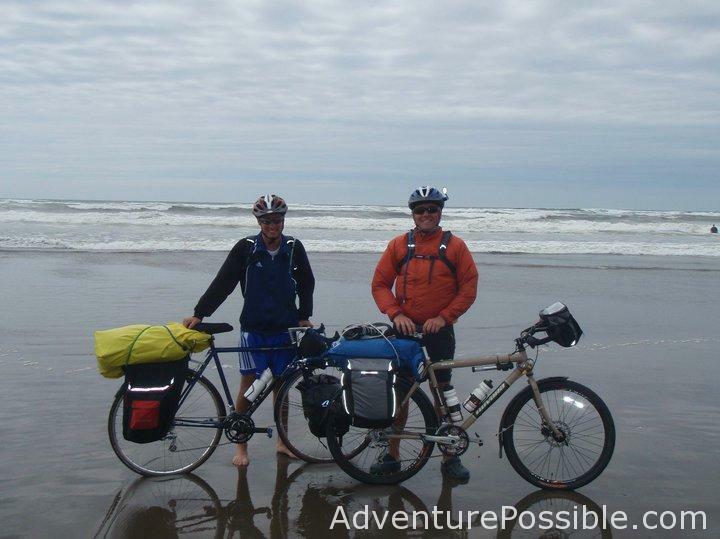 We cycled the Oregon coastline from Astoria through Seaside, Cannon Beach, and to Manzanita. We had several climbs, some being a couple miles long. Those climbs nearly destroyed me. I did well at the beginning when the road took us through some rural areas a few miles inland of the coast. But, once the road delivered us to the rocky cliffs and the jagged shoreline, the scarcity of trees left us vulnerable to a fierce and cold wind blowing west off the Pacific. Whitecaps foamed the seas, and the gusty wind blowing hard against my chest would stand me up in the saddle. The hills we climbed along the coast were made infinitely more difficult by the cold wind. On the uphill, I’d remove my windbreaker because it caught wind like a sail, pushing against me and causing me to stall. When riding downhill, I’d don the windbreaker because of my freezing limbs. I should have checked the weather in Oregon before coming. I hadn’t expected such frigid temperatures. Fortunately, Katie encouraged me to bring my warm clothes. Without them I’d be freezing. Towards the end of the day, we received a demoralizing blow. After our longest climb of the forty miles, we thankfully arrived at Onslow West State Park, where we had planned to stay the night, only to discover that the campground had been closed a week earlier. The note outside the campground cited decaying trees around the campsites being too hazardous for camping in the area. Brian and I sat on the curb, dismayed. Leaning against the rail along the woods were the bikes of two young guys we met in Astoria, their names are Brandon and Malcolm. They had apparently gone below to scope out the danger, but Brian and I left with much disappointment. We decided to bike another five miles to another campground. We set out on a final hill, and I could not pedal a quarter of a mile up the hill without stopping to rest. My quads couldn’t continuously carry me up the hill, and they screamed and strained for me to stop. I’d pedal, pedal, pedal in my highest gear, and then I’d click out to stand and rest. Getting started again on the uphill is hard because it’s difficult to get my shoes properly clicked into the pedals. I need speed to do it, and I only get about one half pedal to try to make it happen. Anyway, I am getting better at it. I’m too tired to continue this entry, though there is much more I want to say, especially about our visitors at the campsite tonight, Andy, Brandon, and Malcolm. I am going to bed. And I will sleep for fourteen hours I bet. It’s just barely raining outside. The drops slap my rain fly and lull me to sleep. I can hear the Pacific Ocean, just a couple hundred yards away.